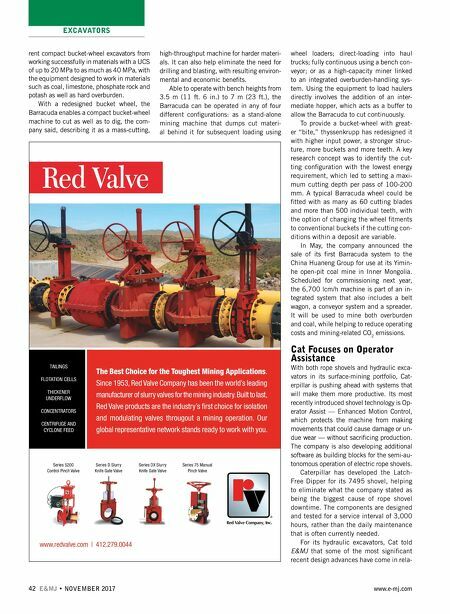 EXCAVATORS NOVEMBER 2017 • E&MJ 43 www.e-mj.com tion to fuel efficiency — such as the ded- icated pump flow allocation technology on the 6020B, and the integrated engine control technology on the 6015B. The former manages the flow of hydraulic oil to the attachment during dig/load cycles, preventing flow sharing during simultane- ous control inputs, like hoist and swing, to improve fuel efficiency, with Cat claiming that the 6020B has shown a more than 25% fuel efficiency advantage over the leading hydraulic shovel in its class. The Cat MineStar System includes the Terrain capability set, which in turn in- cludes the Terrain for loading system for shovels and wheel loaders. Recently up- graded to improve functionality and ease of use, Terrain for loading uses GNSS, data ra- dios, digital mine maps and in-cab displays to guide the machine operator. It provides productivity improvements by showing pro- file and plan views of the orebody to allow accurate bucket positioning. It also auto- matically identifies the material, allowing material tracking and production reporting. Meanwhile, Cat Command for haul- ing technology includes a truck spotting system that is used in Caterpillar's au- tonomous truck system and will be avail- able for manned trucks in 2018. Truck Spotting enables the shovel operator to digitally designate the spot where a truck should park for loading. The display in the truck shows the operator the location and provides a target display to guide the operator as the truck backs into position. According to Cat, the system reduc- es truck exchange times by enabling the shovel to mark the spot and dig and fill the bucket as the truck "spots up." Having the truck at the right angle and location improves the loading efficiency and helps ensure good load distribution for less wear on the truck, the company added. Truck Spotting can also reduce the opportuni- ty for collisions between haul trucks and loading units, and is of special benefit in terms of improved safety and efficiency at night and during poor weather. Liebherr launched its R9200 mining excavator at the last bauma exhibition in Germany. The machine is designed to operate with trucks of up to 140-mt capacity. 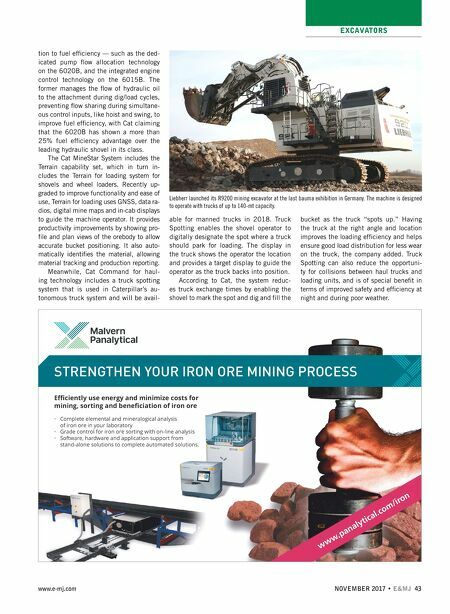 www.panalytical.com/iron STRENGTHEN YOUR IRON ORE MINING PROCESS Efficiently use energy and minimize costs for mining, sorting and beneficiation of iron ore • Complete elemental and mineralogical analysis of iron ore in your laboratory • Grade control for iron ore sorting with on-line analysis • Software, hardware and application support from stand-alone solutions to complete automated solutions.